John Travolta’s 1970 280 SL was stolen from the 1400 block of Berkeley street in Santa Monica in broad daylight. 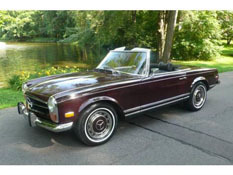 These cars are highly collectible and it’s estimated only 2,400 ’70 280 SL’s were imported to the US. A reward has been offered for information leading to the arrest and conviction of the thieves, but If I had to bet on it it’s likely to either parted out of out of the country at this point.